Re: iwantgames Projects: Hyrule Warrior Fierce Deity Link Released! Zelda looks really nice! SS Zelda in particular looks absolutely adorable as always, haha. uhhhhh I dunno if it's good to ask this, but any estimate on BotW Link? I'm super excited to see it happen-- I love the champion tunic, haha. Good luck on finishing Zelda up! maybe I could do a rapier-like moveset for her. I dunno. I still talk to myself! If anyone wants to use anything I've done, feel free to! But do tell me where you use it, I want to see the finished product! lol, every seems to love that design the most. BotW BotW Link or HW BotW Link? BotW BotW Link is for my build, will be released in a big pack. HW BotW Link i'll probably release after HW Sheik pack. thanks, if you do decide to do it let me know and i'll rig her to mark and optimize the sword if needed. 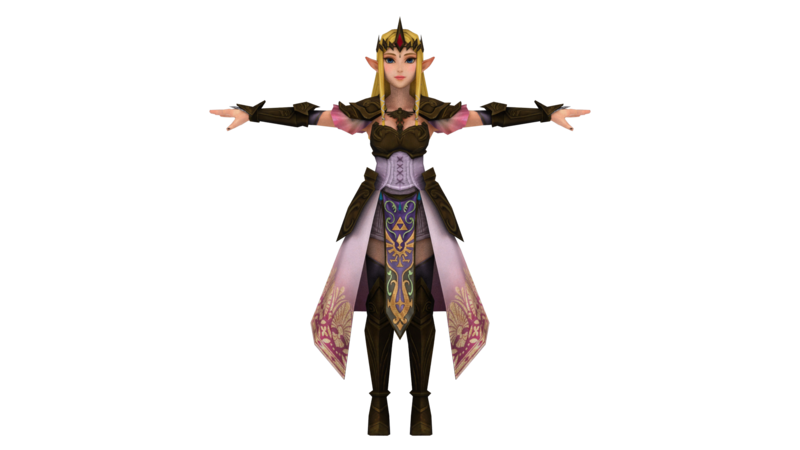 ah, it'd still be a Zelda moveset, no need to do a separate rig, did a similar thing with TP Zelda before as a bit of a test haha. Unfortunately, I don't have fixed weapons for Stalfos Captain. I had no plans to import him or any of his weapons so I never looked at or fixed any of his items. All model import broken if they use physics, some worse than others. Unfortunate but thanks for the answer. Don't think those are fixable, the sword already looks like a jumbled mess of vertices in Noesis before I export it and the shield doesn't export at all. Anyway, Zelda is coming along nicely. Really looking forward to using her default HW costume in my next short. As for progress. unfortunately I am having laptop problems. I have to figure out why it no charge, so progress on all of my previously shown mods are on hold. However, i am currently borrowing another laptop so I will still do some mods. They will be all new mods because I don't feel like restarting any of them. After I figure out the problem with my laptop and fix it I will continue working on my other mods. I am also think of dropping the releasing everything at once into a build idea and will probably just release mods as I finish them. Will probably retexture everything in a certain style, add some new stuff(costumes and menu stuff), and make a build out of everything. Well, that's a bit unfortunate. Good luck on getting it back up and running! i have a question those models are for smash wii u or for brawl and project m? What you call hacks, I call DLC. yeah and tanks. I have a temp one to use in the meantime. so I will do all new mods until I get my charging problem figured out. then i'll go back to my old mods. These are the models from the 3DS(Legends version) but with the high res textures from the Wii U version. They are lagless or at least they should be. Poly count started off similar to the brawl models and all i did was add expressions. Hopefully the expressions didn't push them over, looks like the HW devs left the heads unoptimized for rigging to the face bones. So duplicating them pushed the poly count up. Believe it shouldn't affect gameplay since they are hidden until needed, but if they do cause even a tiny bit of lag i can easily update the mods with optimized heads/expressions. Was planning and tried to have both released last weekend but i ended up falling behind and they didn't make the release. The rigs are still beta and i will work on completing them throughout the week. 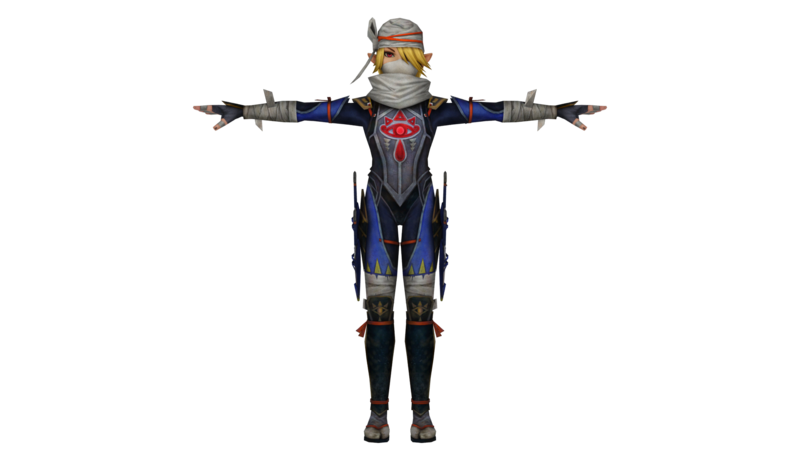 As for sheik, i just finished all of the model work. Will begin the rigging process and post previews late tomorrow to early Wednesday. I will also be importing Hyrule Warriors Ganon and updating Hyrule Warriors Link and his costumes with the optimized 3DS(Legends) models so that we can have lagless versions of them too. Woah, sweet! They do still look pretty great due to the better textures. would it be a bother to ask for Linkle's model? I'll try importing her myself, of course. From what I understand objects that aren't loaded (i.e. different faces) don't cause any lag so these models should be fine. Really impressed that you managed to get the 3DS models. I was looking for those a while ago but from my research it seemed that no one was able to rip from HW legends. I just asked for linkle's model, just waiting on a response. I was surprised, a friend just showed them out of the blue in the discord server that I'm in. So i asked for them so that i could import lagless versions of Zelda, Sheik, Ganon, and Link(Update). that's what i think too. Zelda has 7k of polys and Sheik has 6k of polys with just the default heads. They should be fine at those counts, yeah. I'll do some stress-testing anyway once you release them just to be sure. It's amazing that the 3DS models are obtainable after all. From your previews they don't really look any different from the Wii U models so the lowered poly counts make them a perfect fit for Brawl. Could you maybe ask for Impa as well? I rigged and imported her Wii U model but since I only have very basic 3D modeling knowledge my optimization to make her work ingame is shoddy at best. I'd rather start from scratch with the Legends model.